Huhtamaki's fiber plant is the first in the U.S. to make an affordable dining alternative to Styrofoam, says Rep. Chellie Pingree. Huhtamaki’s compostable school lunch plate is the first affordable such plate manufactured in the U.S., according to U.S. Rep. Chellie Pingree, who toured the Waterville plant Monday. WATERVILLE — The Huhtamaki fiber plant is the first in the nation to manufacture compostable lunch trays and recently entered a contract with six of the largest school districts in the United States to provide the alternative to Styrofoam, officials said Monday. U.S. Rep. Chellie Pingree of Maine said school districts want to switch out Styrofoam trays for a more environmentally sound replacement, but no alternatives have been as cost effective as Huhtamaki’s bid of only one cent more per tray than Styrofoam to the Urban School Food Alliance. U.S. Rep. Chellie Pingree, D-1st District, and USDA Under Secretary for Food and Nutrition Kevin Concannon, right, talk to Michael Wadsworth, production manager at Huhtamaki plant, during a tour Monday. The Waterville fiber manufacturer is supplying compostable lunch plates to six of the nation’s largest school districts. 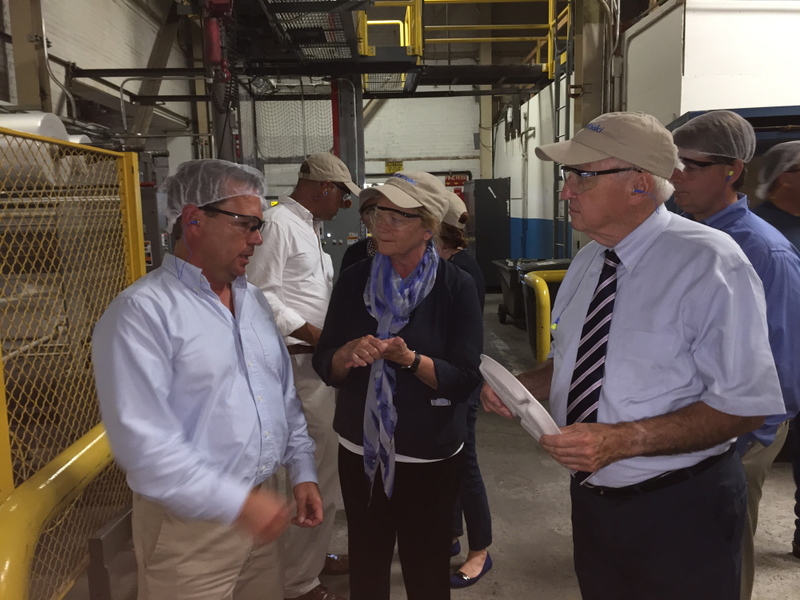 Pingree, D-1st District, toured the plant Monday with U.S. Department of Agriculture Undersecretary for Food and Nutrition Kevin Concannon to get a look at the plates and to tout the plant’s achievement and the message the new product sends. Monday’s tour was closed to the press, and Huhtamaki officials did not immediately respond to requests Monday for information about the contract. Pingree didn’t know if the contract would add jobs, but said that the plant has hired workers recently from the Bucksport Verso plant, which closed last year, and East Millinocket’s Great Northern Paper mill, which also closed last year. The Waterville Huhtamaki plant, which specializes in molded fiber products, employs 550 workers, and Pingree said it’s the first fiber plant in the country to manufacture cost-competitive and compostable lunch trays. The plant, owned by the Finnish company Huhtamaki since the 1990s, has been historically known for its production of Chinet paper plates and dinnerware. Concannon said the plates are wins for both the environment and the economy. The paper trays are round to reflect a plate a child would use at home with four outer dividers for food placement and a central square compartment indented to hold a milk container. Huhtamaki has been making the trays for the past two months, and they will be delivered for the start of the school year to the districts within the Urban School Food Alliance, including the New York, Los Angeles, Chicago, Miami, Orlando and Dallas school districts. 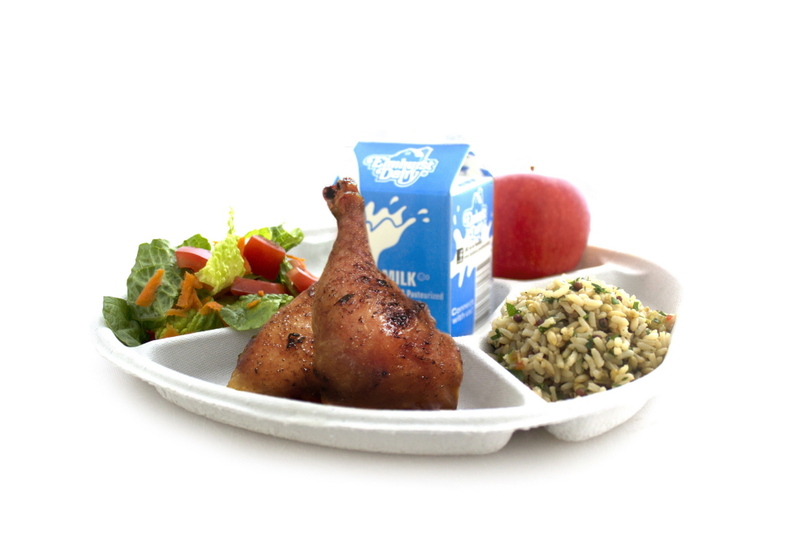 Together, those districts serve 469 million meals to its students, and the move toward a compostable option was part of the school districts’ goal to be serving a more environmentally friendly message to students. Pingree believes that once other school districts see that the Huhtamaki compostable tray is a viable option to Styrofoam and sends an environmentally conscious message to students, they will be eager to follow the lead of the Urban School Alliance.